As per a ‘leaked’ letter being circulated, the newspaper has decided to close down its Kolkata, Bhopal, Indore, and Ranchi editions. It’s not yet clear what happens to the journalists employed for these editions i.e. whether they would be absorbed into the main business or would be laid off. If chatter among the media community is to be believed, most probably they are going to lose their jobs. The letter says that this decision of discontinuing the aforementioned city editions has been taken to meet the changing consumption trends and to focus on the digital business. The blame for this potential job loss and a feared slowdown in the print media industry has been put on – and no prizes for guessing – Narendra Modi. Yes, most of the commentary around the development blames ‘demonetisation’ for it. And when there is an opportunity to blame Modi, how can Arvind Kejriwal miss it? So he too joined the debate. Blaming Modi is a good intellectual exercise, but efforts should be made that it doesn’t become too lazy. No data, such as a drop in sales volumes of newspapers or advertising revenues going down post demonetisation, has been cited by anyone, but somehow it has been concluded that demonetisation is to be blamed. Vineet Jain, Managing Director of Times Group – the competitor of Hindustan Times that never misses an opportunity to show how the Times of India is taking away all the market share and business (and perhaps ‘forcing’ it to cut costs by laying off employees?) – tweeted “supporting” Hindustan Times and blaming demonetisation. Not just that, he even demanded tax breaks from the government for the print industry. Again, no logic or proof offered over how demonetisation was killing print or the newspapers. Without data, even I won’t say that demonetisation is NOT to be blamed. But one thing I can say with 100% certainty, is that demonetisation is not the ONLY thing to be blamed. The crisis in the newspaper industry, and by extension in the journalism business, goes beyond demonetisation, or for that matter, beyond the Indian economy. In last year August, US based comedian and media critic John Oliver had aired an episode on his weekly show Last Week Tonight that focussed on journalism. In the show, he showed how various newspapers in the USA were shutting down and argued that the trend threatened to damage the way entire journalism industry functioned. He painted a gloomy picture, although in a funny way, of the future of journalism. His show re-triggered a debate that already had been raging for many years – why are people not paying to get news? Is the print dying? And if so, can journalism survive entirely in electronic and digital forms? Had Obama or any other head of a western country announced any demonetisation that led to newspapers being shut down in the west? Newspapers are dying, because there is no future. One thought that in a country like India, newspapers and the print industry were relatively safer as the internet penetration and consumption habits were presumably different from those observed in the US. But one thing was clear, this technological impact on print will be felt in India too, though with a time lag. And now that the impact is being felt, people are copping out by blaming demonetisation and Modi. More dangerous is that they are now looking for state support e.g. MD of Times Group asking for tax cuts. He is virtually asking for a bailout. This is not the time to blame Modi but a time to address some fundamental questions that almost everyone in the media industry is struggling with. It is clear that print (the physical platform made of paper) can’t survive in the digital world. 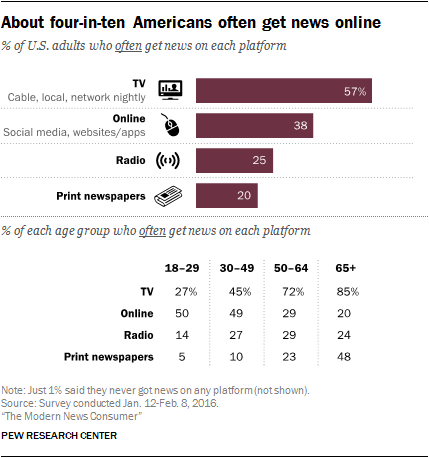 The youngsters don’t like holding and reading newspapers, but they are interested in news and they consume it online, mostly on their mobile phones. As a result, everyone has been saying that digital is the future, but can digital bring the kind of revenues print could bring? It fact, the moot question is – is the ‘business’ of journalism viable in the modern times? Let’s remember that news gathering and dissemination – the ‘business’ of journalism – was a ‘monopoly’ on the print platform. Virtually nothing else but ‘news’ could be printed in a daily broadsheet format. A business house would know the cost (of news gathering, printing, and distributing) and could plan for a revenue strategy (ad rate per square inch and some subscription) that will cover its cost and contribute to its margins. Only the news media houses will get into this competition to define this ad rate and subscription rates, for only news could be published and distributed in daily printed-on-paper format. But same is not the case on TV or digital. Both the technologies are fit for a variety on content on their platforms that compete with news. Which is why ‘journalism’ faced its first major challenge when 24-hours news channels – that were frowned upon by puritans – were launched. Critics claimed that journalism was dumbed-down. Yes it was, because it had to compete with saas-bahu, live cricket matches, reality shows, etc. The ‘business’ of journalism on TV is surviving because TV is still relevant as a technological platform, and because journalism adapted to saas-bahu (all trashy political fights), live cricket matches (live telecast of political rallies), reality shows (the prime time debates) and so on. Furthermore, television as a platform is regulated, it’s not easy to launch a TV channel, definitely not a TV news channel, that can undercut revenues. So the business of journalism is surviving on TV, though in a debatable form. Now the digital challenge is even more complex. The content and experience available here – for free – is much more varied, and the technology is changing fast. The entry barriers for new players are virtually non-existent. So what happens to the ‘business’ of journalism now? Will people pay for news like they pay for Netflix or for so many mobile apps and games? And if they do, will that be enough to cover costs? But instead of debating such points, the media honchos and critics are busy blaming demonetisation. In such a scenario, not only newspapers will die, journalism itself won’t survive. Nonetheless, OpIndia.com will prefer to debate the aforementioned issues instead of getting into a blame game over demonetisation. We will publish articles analysing some of the points raised in this article about business of journalism. If you have a view on them and would want to write on the same, please reach out to us. Let’s get some op-eds before we write the obituary for the print.